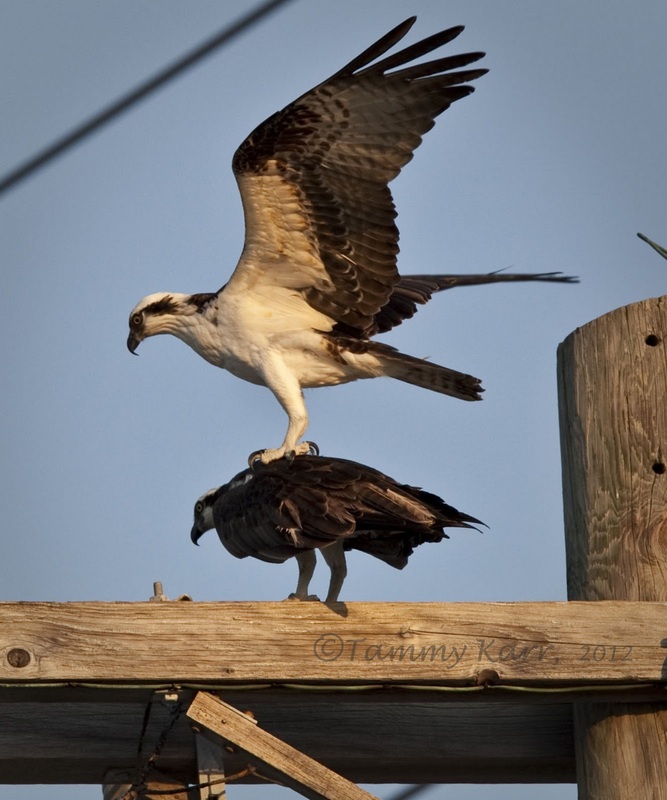 The Ospreys that I saw while visiting the Florida Keys last weekend put on quite a show. This guy looked like he was practicing his balancing skills. 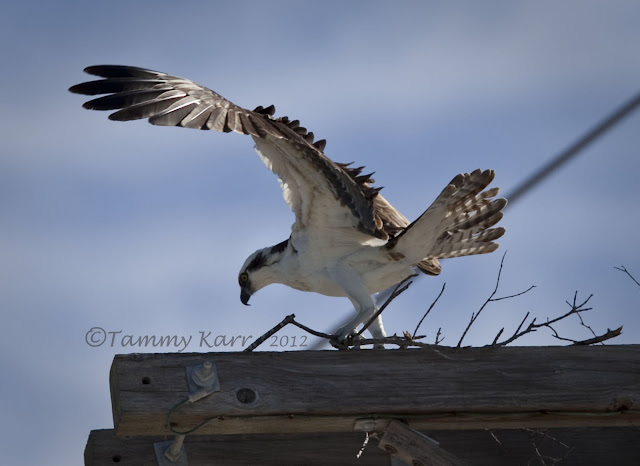 There is a large population of Osprey throughout the Keys. 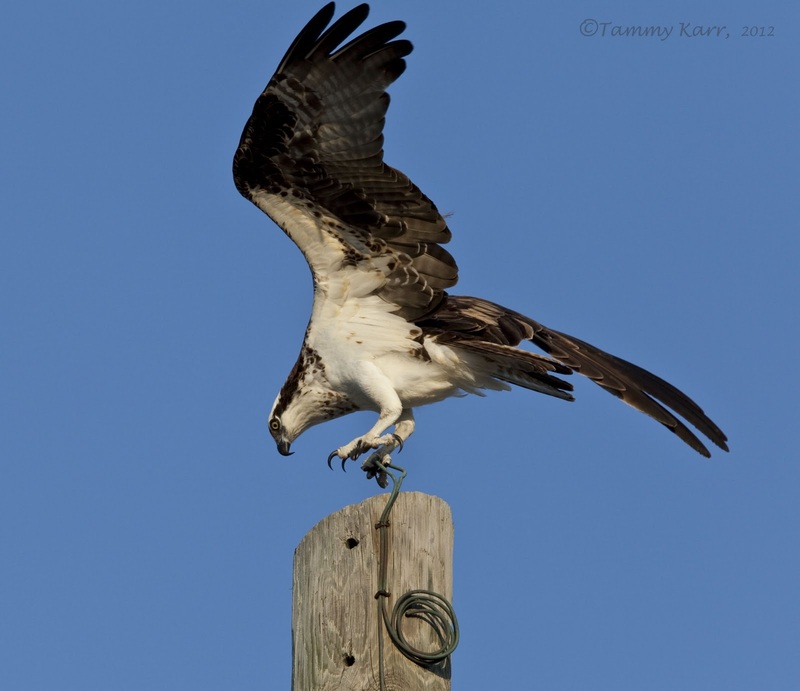 Driving along the Overseas Highways, I noted numerous elaborate nests that were currently being occupied by Osprey. I also had a chance to see this pair starting their nest. I watched the Ospreys from an area called "Tea Table Relief", which is located just north of the bridge to Tea Table Key. 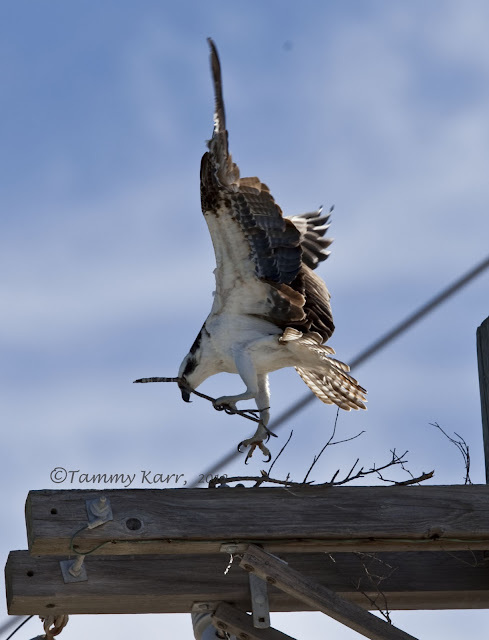 The Ospreys made repeated attempts to break branches off the nearby low lying mangroves. They worked hard for their nesting materials, which is why I felt bad for them as most it fell to the ground. This Osprey was apparently getting on his partner about dropping all the nesting material! Ha! That last picture is adorable. Why do I get the feeling the female is the bird on top? Haha, I'm sure you're right! One of my favourite birds to see in Britain and one of my best shots last year, see 2nd Oct 2011 on my blog. these shots are lovely Tammy, great stuff. Thanks Marc! 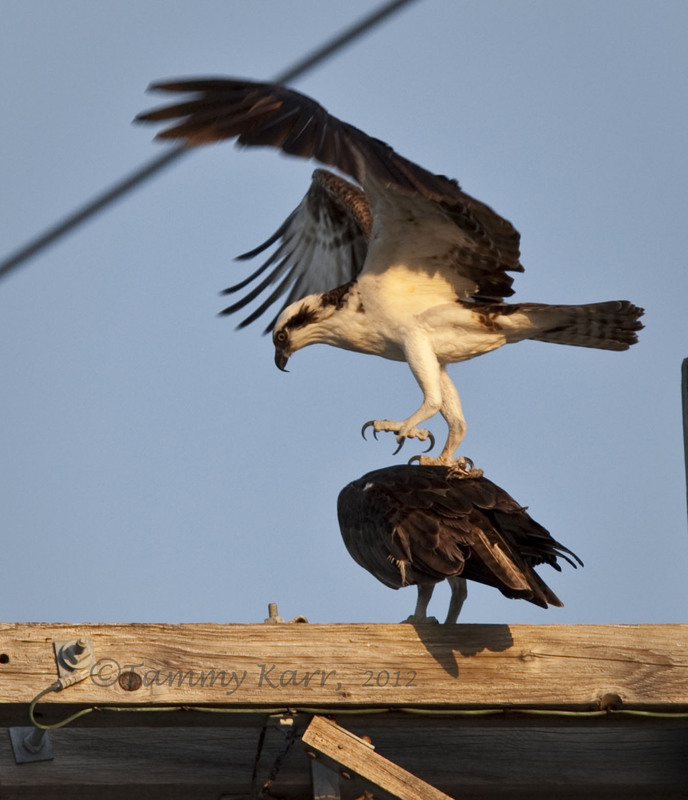 I checked out your Osprey photos. They are beautiful! Perfect lighting!!! Yet another beautiful photos, wonderful images. Gracias Antonio! Hay tantas águilas pescadoras en los Cayos de Florida, divertido de observar! Que maravilla de animal y que serie mas buena de fotografías nos expones. Wow, I'd love to get that close to these stunning birds. Lovely shots. Thanks Christian! I'd LOVE to see some of those amazing owls you see! Buen seguimiento, bien captados y congelados los movimientos de este águila en acción. Gracias Jesús! Fueron emocionantes de ver! Wonderful series of a magnificent bird. 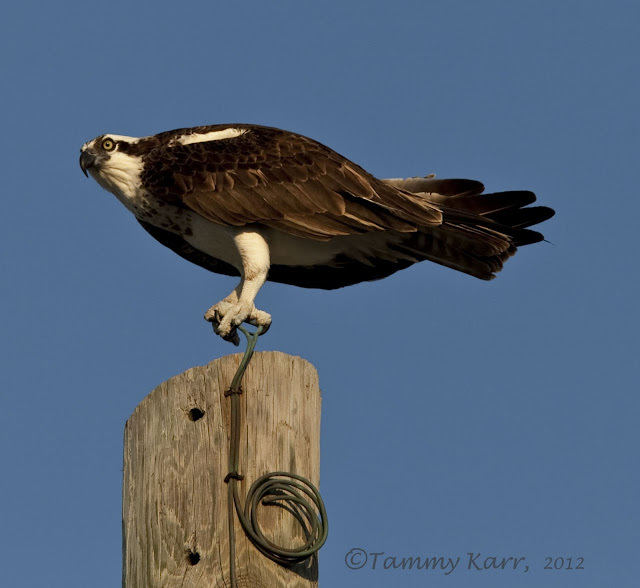 I love ospreys. Raptors of any kind are my absolute favorite birds. These photos are amazing, Tammy! Excellent work!